Explanation: Inspired by the night skies of planet Earth in the International Year of Astronomy, photographer Larry Landolfi created this tantalizing fantasy view. The composited image suggests a luminous Milky Way is the heavenly extension of a country road. 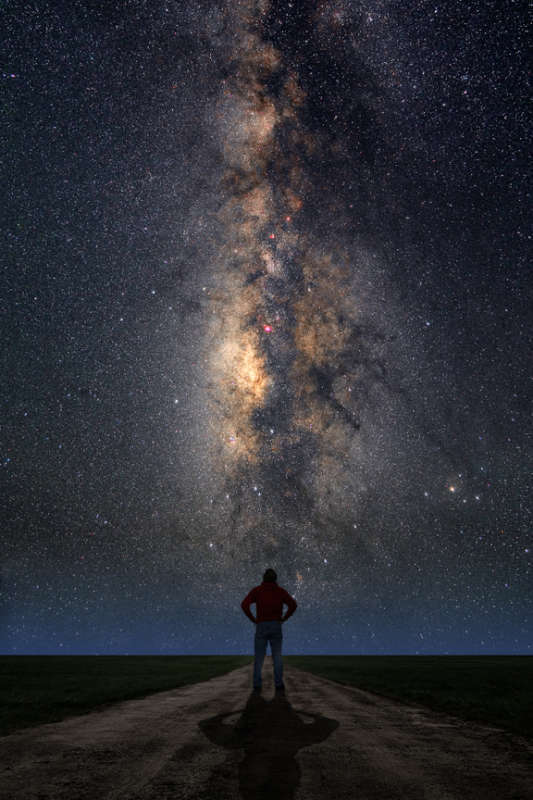 Of course, the name for our galaxy, the Milky Way (in Latin, Via Lactea), does refer to its appearance as a milky band or path in the sky. In fact, the word galaxy itself derives from the Greek for milk. Visible on moonless nights from dark sky areas, though not so bright or colorful as in this image, the glowing celestial band is due to the collective light of myriad stars along the plane of our galaxy, too faint to be distinguished individually. The diffuse starlight is cut by dark swaths of obscuring galactic dust clouds. Four hundred years ago, Galileo turned his telescope on the Milky Way and announced it to be "... a congeries of innumerable stars ..."